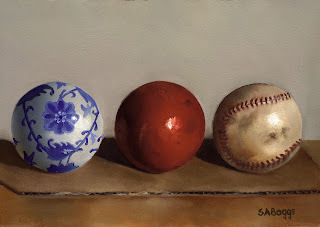 This this is a porcelain ball, an old croquet ball, and a baseball. This painting was an exercise for me to try to paint something interesting out of similar items. My idea was to take three items of roughly the same size and shape but with different surface textures and hopefully add interest to it. I do like the result. I hope that you enjoy the painting!